It's A Dan's World: NOW COMES THE COSPLAYER: Ice, Metamorpho, Mockingbird and Clint, Plus The Best EVER Lex Luthor! 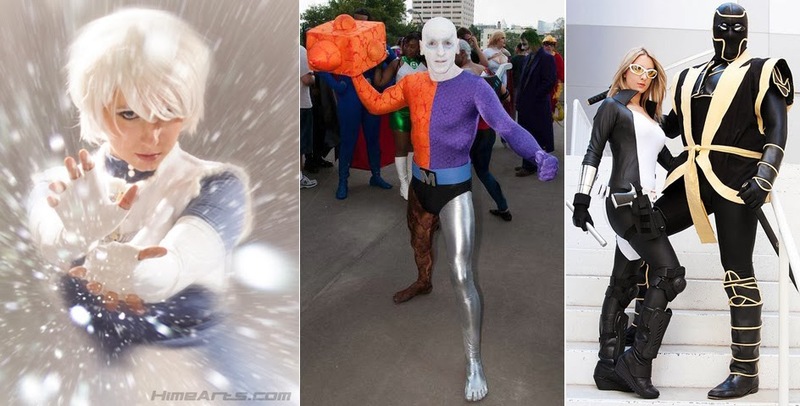 NOW COMES THE COSPLAYER: Ice, Metamorpho, Mockingbird and Clint, Plus The Best EVER Lex Luthor! Considering half this mudball is currently in the grasp of Jack Frost, kicking the first cosplay feature of 2014 off with the Justice League's Ice seems a pretty apt idea. Sure it would've been more apt if I'd stuck her in the Christmas edition, but hey, timings always been my Kryptonite. Okay, so that and spelling - I'm only human! Created in microsuede by deviantARTist Riddle1, seams were kept visible to give the costume "that nordic look". Add a bit of hand sewing here, and a bit of polar fleece there, and you have one woman ready to take on any Guy! Her companions beside her perfectly balance out the two sides of my brain. 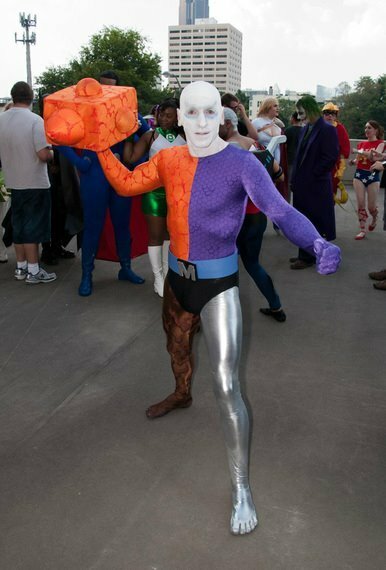 As The Outsider loving side makes me run round in circles screaming 'Someone's finally cosplayed a decent Metamorpho!' the West Coast Avenger half slaps sense out of me, and then gets me doing the same, yelling 'Mockingbird and Clint for life!' Sure, Clint is in his Ronin guise rather than as Hawkeye, but the final result is still one worn out set of vocal chords and a carpet to match. Rex is stunning in all his Elemental glory, and is found on the periodic table folks call Tumblr, while Bobbi and Clint come from photographer Anna Fischer's fabulous Flickr portfolio! Now if you've seen them, you've no doubt seen Lex Luthor here, and if you are a fan of DC in the 80's like me, you probably need a clean pair of pants. 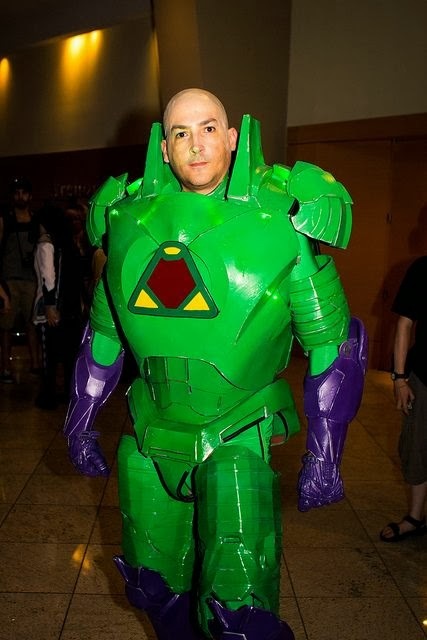 This is my Lex Luthor! Despite meeting the rouge first in the Christopher Reeves' Superman films, the first thing I remember making a 'business man in a suit' seem a match for Kal-El, was this armoured version I first clapped eyes on in the Kenner Super Powers toy range! Snapped by Pat Loika at Dragon Con 2013, just look at the detail and effort this guy has gone into. Every time I see it, I spot a slight aspect I didn't spy before, from the corrugations in the armour to the joints throughout that make it moveable! Now if he could just team-up with a guy who put the same amount of detail into a robotic suit with matching tentacled spaceship, the 80's comic fan in me would move to Depends Undergarments for life. I love the photo-shopping for Ice's completed cosplay portrait. And of course Metamorpho and Lex cos-players knock it out of the park on their end. Hell yeah. Sad when the cosplayers are more exciting than the source material right Dan? You know what Dale, I've completely lost track with where Metamorpho is/was in the DCU. Was the Element Woman in Flashpoint supposed to replace Rex? I hope not, he was my favourite part of The Outsiders, and I always watch for him to make a decent comeback, especially as he's one DC icon who Marvel really doesn't have a counter to. They don't do they? Not even close. I guess for now, yes she has. That isn't to say ol' Rex might turn up again, but for now, yeah Element Woman replaced Rex. Blamwe Johns for that. Hey, that was me and my wife as Ronin and Mockingbird... thanks for the shout out!